When you are on vacation, sauces in a bottle are a godsend. On the last day of our most recent vacation to Kailua-Kona (the Big Island of Hawaii), our traveling friend was the big winner of leftovers roulette, coming up with this great salad based on whatever we had. Even the wasabi Doritos were gone. She used the leftover chicken (that was grilled using a bottle of Roy's Misoyaki Marinade) and topped it with Feast from the East Chinese Chicken Salad Dressing. If you are at home, the from scratch version of the dressing is very simple and just as good. Cook pasta to just slightly under al-dente and drain. If making dressing, mix together vinegar, sugar, sesame oil and black pepper to your taste. Drizzle in just enough canola oil to hold it together. Add roasted sesame seeds at the end. Toss pasta with a bit of dressing so it absorbs some of the flavor. Chop chicken into bite-sized chunks. 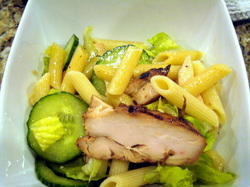 Toss pasta with lettuce, cucumbers and chicken. Add more dressing to your taste. 1) The salad will wilt, but will still taste really good the next day. 2) Roy's Marinades are available online and at most grocery stores in Hawaii. 3) Feast from the East Dressing is made by a restaurant in Westwood (LA!) and is available online, at Imahara's, Marukai and sometimes, Costco.